This week, I had the pleasure of interviewing Jared Karol to learn more about his story of becoming a freelancer and growing his freelance business Storytelling for Good. Through Storytelling for Good, Jared supports mission-driven entrepreneurs to get clear on how to tell their personal stories and connect more deeply with their audience. He focuses on how our personal stories are big part of our business stories and the value we bring as social entrepreneurs. What inspired you to create a freelancer business out of storytelling? It comes back to my origin story. When I was fourteen years old, my dad told me he was gay. That totally rocked my world. I had been living in a pretty conservative, not so diverse suburb of San Diego. I didn’t think I knew any gay people. As a teenager and college student in that environment, I was confused, embarrassed, and a little ashamed. But as I got older, I realized I had a choice – I could continue to let that be my story, or I could change my narrative. Through the relationship with my dad, I was given an opportunity to embrace my story and connect more deeply with other people. Then, when I was 27 years old, my father died of AIDS. That was another turning point for me. I was still living in San Diego, parking cars to make money and surfing, but not feeling like I had much direction in my life. The loss I felt from his death propelled me to move up to San Francisco and undertake a deeper personal exploration. I began connecting with a really diverse group of people and learning about different cultures, ideas and perspectives. So, my journey has been from a kind of provincial background to curiosity about people and embracing their different stories. This is my origin story. And, I believe that everyone has a personal story that has inspired them to do what they do. A little over a year ago you transitioned from being an employee to being a freelancer. How did you make that transition? I was laid off, or as I call it liberated, from my job in January 2016. But about a year prior to being laid off, I knew I wanted to get out of that job. It was an easy job doing content and editorial work for a technology startup, but the work didn’t have the kind of social impact I wanted. As a result, I was bored and had lost my purpose. I went to a coach. She calls herself a resiliency coach. She helped me realign with my purpose. As I was talking about the experiences I wanted to have around freedom, autonomy, and building relationships, she said she could see me as an entrepreneur and that I might want to consider doing my own thing. Except for a brief stint in between jobs when I took a couple of freelance gigs, I had worked for someone else as an employee. My first response was of overwhelm and fear. Then, I put my trust in the process and asked how that could work. She advised me to keep doing what I was doing, follow the leads, and talk to people who are doing the things I want to get involved in. She told me not to worry about what to offer as a service yet because it is more important to be aligned with my purpose. By the time I was laid off, I had met a couple dozen people and had started thinking about where I was going. But even though I wasn’t starting from scratch, it still took me a couple months to get my first client. 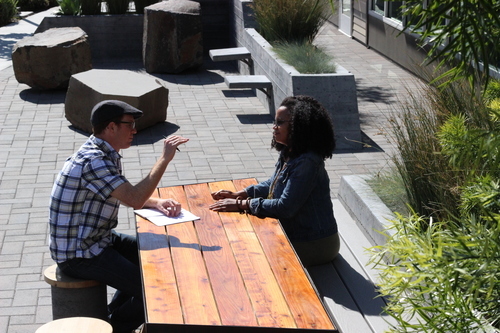 One Friday afternoon in mid-February 2016, I sat at the picnic table at Impact HUB Oakland with a box of cookies and a sign that said something like “free communications consulting.” I just started talking to people who came by, asking and taking notes about the communication and writing needs of their organizations. The conversations were totally informal. I wasn’t pitching. Well, I didn’t have anything to pitch or offer them at that point. About a month later, one of the people who stopped by that day reached out for some help with a cover letter. Even though I hadn’t officially launched as a freelance business, I did a few sessions helping her with her story and cover letter. It gave me confidence to know that someone valued that initial conversation enough to come back and work with me. I realized that I can do this. I can provide a service to people because I have this background, skillset and expertise. It was good for me to have that in an unofficial capacity. And then, how did you translate that into a full-fledged freelancer business? After that, I took the Uptima Freelancer Accelerator class. I don’t think I came up with Storytelling for Good right away. I was just going to get a website under my name jaredkarol.com. I was going to offer coaching, writing, presentations, workshops, all these things. My mentor in the class, Kelley Nayo Jahi, helped me discover that I was offering way too much right out of the gate and that I should hone in on one or two services. I chose to focus on coaching and writing and look for those contracts. I started to get some contacts with organizations I met at the Impact HUB Oakland. The work was a little all over the place, which was fine. Through those contracts, I learned more about the types of work I really enjoy taking on versus the things I’m qualified to do, but don’t find as interesting. I’m still not quite in the position to turn down the latter, but I’m not actively seeking out that work. What/who do you enjoy working with the most? I enjoy the one-on-one coaching. My ideal clients are ones that 1) are working on something that resonates with me topic-wise, or content-wise and 2) are receptive to my feedback, guidance, and expertise. With these clients, it’s fun to sit down and work through their messages. If I could have three or four of those meetings a day and get paid… Done! Do you have a process for identifying whether a client is a good fit? If I get a lead or referral, I start by doing a high level screen of what they’re working on and whether it has positive social impact. I know that’s a broad term, and I even take a broader lens. As an example, one of my clients is a statistician and researcher in the medical industry. Most of what he researches is pharmaceuticals for pediatrics and medical devices that are going to help in hospitals. I don’t think he would consider himself a social impact entrepreneur, but he is creating positive social impact. Then, if I’m interested in the organization’s work, I’ll explore the client’s needs and identify what support I can offer. What has been the most fun thing about being a freelancer? There are really two things. The first is the people I get to meet. Through this work, I’m constantly meeting and learning about new organizations and new ideas and getting connected with people doing great work in social justice, equity and diverse communities. The other fun thing is the autonomy I have. Some days I’m super busy and other days I can take a couple hours off and watch a soccer game. It’s nice to know I can set my own gig. For example, the first week of April is the kids’ spring break and I’m going on vacation. I can just shut down for a week – I don’t have to ask a boss, don’t have to take PTO, and don’t even have to tell anyone unless they want to meet. What are you most proud of in your progress as a freelancer over the last year or so? I’m most proud that I haven’t given up on being a freelancer. I could see myself having easily given up just out of fear and uncertainty. I’m happy that I’ve stuck through it even though the level of income is not where I’d like it to be. But, there are enough signs that this is going to work. I’m also grateful that my wife and kids have been supportive as I navigate the process of growing this business. What has been the most challenging thing for you as a freelancer? I would say the same thing: sticking with it. It’s a lot of uncertainty. For example, the second half of March, I’ve had four, maybe five, clients that are almost closed. But for various circumstances, they just haven’t closed yet. Six months or nine months ago, I would have freaked out. I would have been bothering them, trying to get them to close. Now, I have a different approach. If these clients are meant to be, they will happen. Of course, I’m going to follow up and be persistent. It’s been a little bit of a challenge to remember, I can’t freak out. While I do need to make money from clients, it needs to be aligned. It has to be the right time for us to work together, so I’m better able to serve them. If and when it’s the right time, then they’ll pay me and we’ll accomplish more working together. It’s both a strength and a challenge to keep this mindset. Despite the uncertainty, you’ve been able to maintain a consistent mindset. How do you do it? My mindfulness practice has kept me centered. I meditate every day, and that helps. But, it’s more of a philosophy – what I’ve learned through experience, reading, meeting, and talking with other people about sitting with uncertainty. Every minute, every day, every week, every month, every year, we have ups and downs. It’s not always just going to be going swimmingly, but it’s not always going to be horrible. I’m learning to trust the process even though I might not know what the process is. That helps me when there’s a month where I don’t make any money – rather than slip into thinking that this is the way it is and freelancers don’t earn money, I acknowledge and observe my emotions of concern but don’t react to them. I let it go. I do the same thing when I have a good month, so I don’t get attached to the windfall. I ride out the highs and lows and try to stay focused on what I need to do – keep meeting with people, keep putting together content, keep doing workshops, follow the leads and cultivate relationships. You also incorporate mindfulness into your freelancer work. Can you talk a bit about that? On my website, I have a tab that says lenses. Equity is one of them, and mindfulness is the other. I don’t explicitly share that when I’m working with clients, except when I feel it’s appropriate. But, it really does drive how I work with clients. One of the things I say to my clients is that we can sometimes hijack our own narrative. Sometimes we let the way we react to situations that cause stress, anger, or other negative emotions, become our story. And, then it takes us away from our authentic self. How have you hijacked your story? That’s a good question. I took a detour. For many years, I was a teacher and was teaching a social justice curriculum. I didn’t think of myself in these terms, but it was social impact – helping kids understand what was going on in the world, what negative effects our social structures and systems have, and helping them think about better solutions. When I left teaching, I wanted to be a “writer.” I landed at this technology startup as an editorial assistant. At first I thought it was cool. But, after three years I couldn’t stand it anymore. I essentially hijacked my narrative. I wasn’t thinking of myself as a social justice advocate and ally. And, I put myself into a position at an office in Burlingame with five other straight white dudes trying to make a shopping app. Granted, I learned a lot from that experience, such as business and tech skills which I apply to my freelancer practice. It wasn’t a total waste of time. But, it did hijack my narrative. Now, I’ve rediscovered my narrative in the last year and a half. What advice do you have for someone who is looking to get started as a freelancer? On one hand, I feel so new to freelancing that I’m not sure how good my advice is. Or maybe, it’s great advice because I am new to freelancing? I recommend that as you explore your interest in freelancing, spend less time thinking about the skill you are going to offer. Of course, that’s important – you have to provide a service. But, before you can define the service offering, you need to understand the kind of experience you want to have. Some of this I know Kelley talked about in the Freelancer Accelerator classes – think about the kind of lifestyle you want to lead, what’s important to you, and the types of people you want to interact with. If you don’t define that early on, it’s hard to change a few years into the business. Also, avoid mission creep. You might not know your mission right from the beginning. But, you want to start establishing that solid foundation. Then, you can be honest with yourself as opportunities come up. You can more clearly see if the opportunity is going to take you in the direction that you want to go. That’s been tough for me. It’s about setting boundaries, turning down opportunities when you know that’s not who you are and that’s not the direction you want to go. It takes trusting that new opportunities will come if you put yourself in the places, and in front of the people who are aligned with your mission. If you are a mission-driven entrepreneur, learn how you can work with Jared Karol / Storytelling for Good to tell your story more effectively. Or, sample Jared’s work next month as we host him for Uptima Presents: Authentic Storytelling for Mission-Driven People.